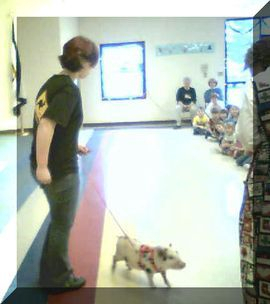 We love our potbelly pigs. This is Filbert and Polly, our pig parents next to our dachshunds... You can see how small they are. This is Hamlet. He is neutered and just a big pet. "Tecup does not mean they fit in the palm of your hand, it means they are MUCH smaller then their (farm pig) cousins! 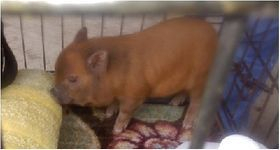 Teacup Pig or Mini Vietnamese Potbelly: 14-16″ and under. 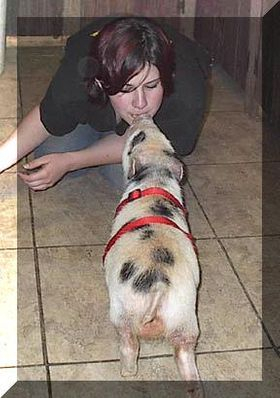 This size is just another name for a smaller pot bellied pig and weigh anywhere from 30-40 pounds. 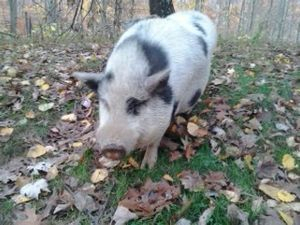 Potbellies are a mixture of colors, but are predominately black, black and white, or pink with black and gray markings." The most common type of mini pig is the Potbellied Pig (also called Vietnamese Potbellied Pig, Miniature Pot Belly Pig, or Chinese Potbellied Pig). The KuneKune is also a mini pig, but weighs in at around 400 pounds on average and looks more like their cousin the farm pig. 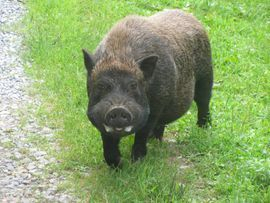 Another breed is the Guinea Hog which is about the size of a large pot, but looks a bit thinner and taller. (I'm not sure of the weight). They look similar to a pot minus the belly and a lot hairier. As for the so-called Teacup or Micro Mini pig's, these are just normal potbellied pig's that have been chronically underfed and malnourished in an attempt to keep them small. Their life span is maybe FIVE YEARS. This is because the pig stays tiny, BUT THE ORGANS continue to GROW NORMAL SIZE for a normal size pig. Teacups, Micro-Mini's, European Bluebutts, these are all fancy names made up by breeders. All potbellied pigs within the United States come from the same line. The only reason we have very small, tiny PBP's is because of unscrupulous breeders inbreeding the pigs, or telling people not to feed them much in order to keep them small. 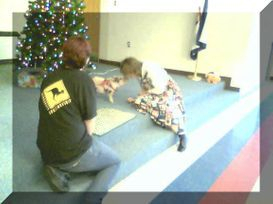 That is animal abuse. Please do not fall for this. Here are a few other sites with information on these so called tiny pigs; Teacup Pigs? True or False? / Tiny Pigs?? 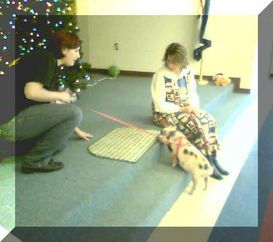 / Teacup Pigs"
He was taught to gently take snacks from my daughter's mouth. 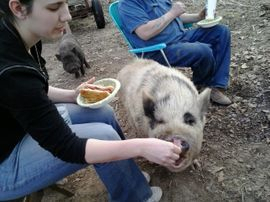 He is still a sweet pig and loves being given snacks. This is Filbert at 6 weeks and at 3 years old. He is the sire of all the piglets.